Aug 31, 2018 • The Osa Peninsula, located in the southern region of Costa Rica’s Pacific Coast, is one of the most biologically-diverse places on Earth and a popular ecotourism destination. Previous work through NASA DEVELOP showed positive trends in land use since the implementation of the 1996 Forest Law legislation, which supported reforestation and riparian health. However, the area still faces watershed degradation and loss of biodiversity due to deforestation, pollution from agriculture, and human settlement. NASA DEVELOP partnered with Osa Conservation to analyze land cover change in the peninsula to better understand threats to river water quality and watershed health. 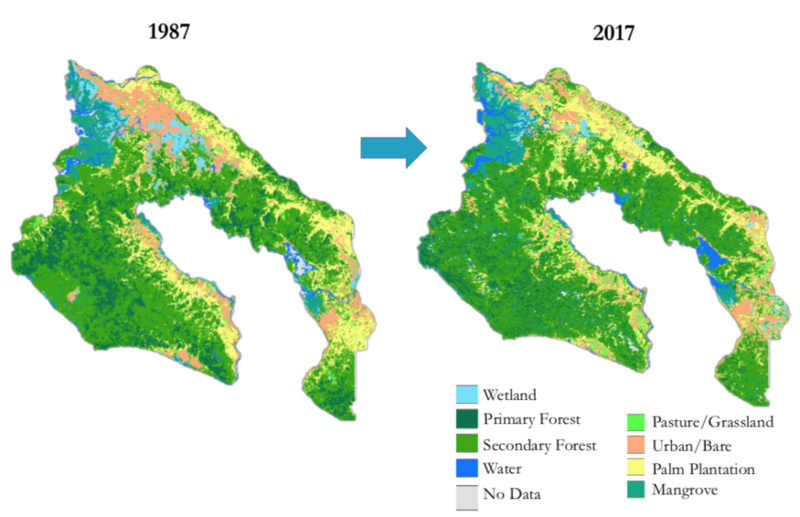 This project used Landsat 5 Thematic Mapper and Landsat 8 Operational Land Imager to create land use maps, which were used to analyze change in riparian case study areas. Additionally, the team used a Soil Water Assessment Tool (SWAT) model to predict and visualize the effects of riparian restoration on river water quality. The model examines Terra Advanced Spaceborne Thermal Emission and Reflection Radiometer (ASTER) elevation data, Tropical Rainfall Measuring Mission (TRMM) and Global Precipitation Measurement (GPM) Dual-frequency Precipitation Radar (DPR) data, soil data, and land use data. In situ water quality data provided by the partners were used for model calibration and validation. The partners will use and distribute results of this project to the National System of Conservation Areas (SINAC), Ministry of Environment and Energy (MINAE), and local communities to inform land management decisions, policy enforcement, education and outreach initiatives, and watershed restoration and monitoring. This entry is filed under Ecosystems and Biodiversity, Forest Management, News, Video.